The North Shore is made up of several different communities. Seymour, with its relaxed vibe, charming shops and restaurants and, of course, endless list of recreational activities, has long appealed to families and outdoorsy types. Residents have access to excellent skiing, hiking, mountain biking, kayaking and paddle boarding all in their backyard. 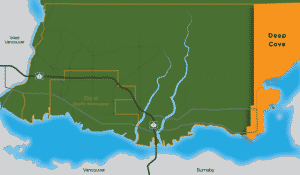 The area of Seymour lies east of the City of North Vancouver. 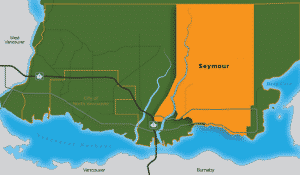 It’s defined by Seymour River and its canyon on the west, Deep Cove to the east, Burrard Inlet to the south, and the forests of Seymour Mountain to the north. The community encompasses Riverside, Seymour Heights, Blueridge, McCartney Woods, Windridge, Windsor Park, Northlands, Parkway, Parkgate, Indian River and Roche Point neighbourhoods. Seymour is a highly-residential, low-density neighbourhood. 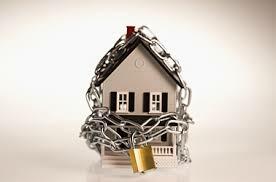 Home ownership in the community is high and average family income in higher than in the District as a whole. As such, it’s mostly comprised of expensive single-family homes—often surrounded by trees, forested parks or located along the waterfront. When it comes to diversity in housing choices, Seymour falls short. The community lacks townhomes, condos and more affordable forms of housing that would meet the needs of those wanting to downsize, the missing middle and young families. One new development is Seymour Village, a master-planned community from Takaya Developments and the Aquilini Group. 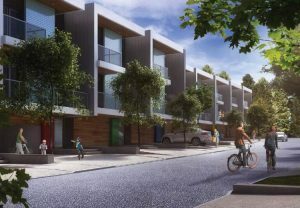 Designed with contemporary, West Coast inspired architecture, Seymour Village features three and four bedroom townhomes that range in size from 1,851 to 2,043 square feet. The biggest draw to the community is Mount Seymour, a family-owned local mountain. 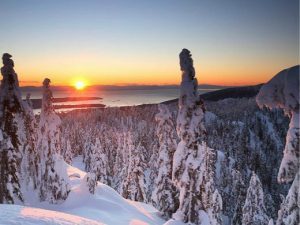 Mount Seymour offers skiing and snowboarding in the winter months within an 81-hectare controlled recreation area—and 14 hiking trails of varying lengths and difficulty for the rest of the year. With its forests and snowy slopes, Mount Seymour is often used as a filming location, like the Twilight Saga and Stargate SG-1. The area also boasts two major golf courses: Northlands and Seymour Golf and Country Club. Did you know? During the 1930s, people started to build cabins on Mount Seymour—at one point there were about 200 on the mountain! Stays in the cabins would cost 10 cents per person during the week or 25 cents on weekends. The North Shore is known as being a major traffic hotspots in Vancouver. Most people rely on their car to get to shops and services, resulting in congestion and delays on roads and bridges that are heavily used—including Dollarton Highway and Mount Seymour Parkway. In January of 2018, a steering committee made up of elected officials and a TransLink representative was formed to lead the Integrated North Shore Transportation Planning Project. It founds that challenges like the lack of affordable housing to support a local workforce, abundance of single-family residential areas, a constrained road network, and capacity limitations imposed by the two bridges create unique transportation impacts for the North Shore. 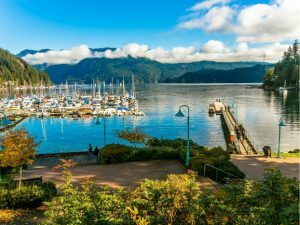 Located at the foot of Mount Seymour, Deep Cove is a picturesque waterfront community with an irresistible laid-back vibe. Like Seymour, Deep Cove has it all: forests, mountains, the oceans, a beach, hiking, stunning views, and a wide selection of charming shop fronts. 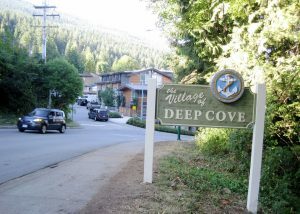 Deep Cove’s only downside is its popularity in the summer months—when people from surrounding areas flock to the community. Deep Cove is the easternmost neighbourhood in the District of North Vancouver. It’s bounded by the Seymour community to the west, the waters of Burrard Inlet and Indian Arm, and the wilderness forests of the North Shore mountains. Deep Cove was once a popular summer resort location for Vancouver residents in the 1910s. Today, the housing serves as a reminder of this history. Most of the real estate market in Deep Cove is made up of detached houses—usually in the form of older cottages, character homes and quaint bungalows. There are also many contemporary luxury waterfront properties in the area, boasting spectacular views. While the condo and townhouse market is limited, some can be found near the heart of the village. Deep Cove has a unique blend of cultural and recreational activities—a theatre, art gallery and cultural centre are located on its main street among the shops, cafes and restaurants. A few favourites among locals and visitors alike are Honey Doughnuts, Café Orso and Arms Reach Bistro. Quarry Rock is one of the city’s most popular hiking trails. The downside is that the area becomes flooded with tourists and visitors the summer months—a problem so acute that new measures were added to restrict the number of people who can hike it at a given time. Park Rangers are also on site all summer, monitoring parking availability and trail access, and tweeting regular status updates. The tranquil waters of the Indian Arm—a 18-kilometre fjord that extends north from Burrard inlet in Vancouver—make Deep Cove a popular place for boating, kayaking, canoeing and scuba diving. Did you know? Deep Cove maintains a no-plastics policy. In May of 2018, it officially said goodbye to plastic straws—becoming the first city community in Metro Vancouver to do so. Deep Cove, at the farthest eastern end of North Vancouver, is a bit out of the way for getting around. However buses do run regularly in and out of the community, and Highway One is just 10-minutes away. We hope you enjoyed this snapshot of Seymour & Deep Cove! Please reach out to us if you have any questions.